# just run "sudo trimforce enable" to activate the trim support from now on! # Important: Add "kext-dev-mode=1" as Kernel Arguments or the computer won't boot. Any idea if 10.8.5 will break TRIM? I'm a bit afraid to update. it works on 10.8.5, tried it out myself. Is there a reason you omit the two lines which will clear the cache? thanks for this script. I had success on Mac mini (10.8.5) with it, but seems not working on my hacintosh 10.9GM (OCZ-VERTEX3). I am also using OCZ-VERTEX3. Suddenly today, after nothing more than a reboot, my mac refused to boot and went to the "no entry" grey screen. I did a verbose boot (alt-command v), and got a repeating error message saying "still waiting for root device". Can more people please confirm if this does work on 10.9 GM? Anyone tried it on Mavericks (10.9)? Confirmed for 10.9.4 with a Plextor 256GB M6e. Thanks!!!! Confirmed for 10.9.4, KINGSTON SV300S37A120G Thanks! Works for 10.9.4, MacBookPro5,5, OCZ-AGILITY3 (setup as a Fusion drive with a WDC WD10JPVX). Beware: after 3 days of steady use I encountering random beach balling, culminating in losing the boot sector. I wasn't able to restore the boot partition or repair the disk. Similar reports on the plextor user forum. Doesn't work with 10.9.5 & 256GB Samsung 850 Pro SSD. Takes all command, gives no error but no TRIM support after reboot. I have SSD connected on MacPro 5,1 (beneth the Superdrive, not into HD socket due to missing adapter). What can be wrong - SATA cable not the same as SATA socket or something about the software? This will break Yosemite final release so please don't use it. Perhaps you need to rebuild kext cache? Any idea how to fix now that my computer won't boot correctly? Update: disk repair won't fix this. I had to reinstall Yosemite from my boot partition. I've already done my good deed for today. Thanks, your revised instructions worked with Yosemite. @kike1 The commands after the first shutdown command are never executed. Somebody should probably change the name of the Gist. Anyway, just copy and paste the commands one by one. Work perfectly for 10.10 clean install, then stuck with white circle grey background while update to 10.10.1. But its working after recovering and re enable. (Samsung 840pro 256Gb - MBP 15" early 2011). This worked for me on MacBook (13-inch, Mid 2010) with 240G Intel 530 Series at 10.10.1 clean environment. I just did it on OS X Yosemite 10.10.1 on a clean install. Worked like a charm. Thanks! Seems to work on Yosemite for me on my Kingston V300. Still working with 10.10.2 Public Beta. How do I disable TRIM on 10.9 before upgrading to 10.10? Funny, I didn't work on my Yosemite 10.10.1. Any extra steps you guys above took? PS: In any case I downloaded Trim Enabler but I am curious to understand why this didn't work. Confirmed for 10.10.1 and Samsung SSD 850 PRO. Thanks! Works like a charm with 10.10.1 and a fusion drive setup with an Intel 330 120GB and a stock 1TB HDD. Works perfect on 10.10.2, but after the update you need to turn it on again. Thanks. This works perfect on Yosemite with Crucial MX100 256 GB in a 2012 Macbook pro. Worked for me. Samsung 850 EVO 500GB on mid 2012 MacBook Pro with Yosemite 10.10.2 and Samsung EVO 250GB on 2011 MacBook Pro with Yosemite 10.10.2. I also wrote a tool called TRIMCheck that verifies TRIM is enabled on your SSD drives at each boot and shows a warning message if it is not. This is intended to remind you to rerun the steps in this gist in case an OS X update has updated the kext driver patched by these instructions. The shell script works well on Mavericks 10.9.5. After rebooting to this drive verify that all 3rd party SSD drives in the system show "TRIM Support: Yes"
Boot every once in awhile to this drive (e.g. once a week) and run Disk utility choosing "Repair Disk" on your third party SSD. Observe occurrence of prompt message "Trim unused space"
This way you won't have to mess with the kext signing still preventing write amplification. Please note: That worked for me on a Samsung 840. Maybe some SSD drives fail on the OS's TRIM command. So, please use at your own risk and better yet, make a backup prior to your first attempt. It did not work for me with my X25-E Intel SSD drive. (Yosemite 10.10.2, MacBook Pro, Late 2008). I tried it several times but I still get TRIM Support: No in the System Report. The Internets are controversial about why is that: some write that the SLC based SSD drives do not need TRIM, some argue. 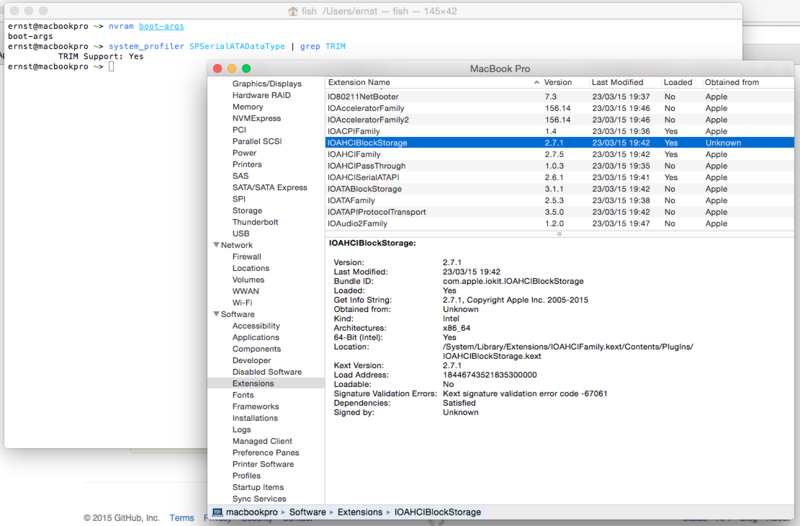 The script works fine on a Yosemite Macbook Pro with Samsung 840 Pro SSD. However, I understand that if I upgrade to a newer revision of Yosemite in the future, the kext signing may be switched on again by the upgrade, which will mean I won't be able to boot the computer (as TRIM is set to on). I'm very new to all of this so what are the steps for disabling TRIM before any upgrades, please? If I used the SDD for long without TRIM enabled and apply this script, does OSX zero out all pages that are currently filled up with deleted file data on the SSD retroactively? I had automatic upgrades switched off and always check this site before upgrading. hfoffani - thanks for that. I've just installed the latest security patch to Yosemite 10.10.2 and all went OK and TRIM was still enabled after the update. BUT ... what if there is a more major patch/upgrade to Yosemite - e.g. to 10.11? would I have to disable TRIM before applying the upgrade? And if so, what are the exact steps / script to do this? Sorry if the questions seem a bit naive. Just want to be as sure as I can not to mess up my BBP. (I do have a full backup but this takes several hours). Bialykot. No, you don't need to anything. After upgrading, you'll see that TRIM is unsupported again so you have to apply this patch (or the corresponding one) again. That's why many of us had switched off OS X autoupdates. It's better to check this site before upgrading in case some incompatibilities appears in a future version. additional SSD 521Gb for data and virtual machines at the place of the superdrive. Thank you! 10.10.2 and Samsung SSD 840 EVO work great. It doesn't appear to be working after the 10.10.3 update. After running the perl line the driver is unchanged, so it seems that we'll need a new pattern to search for. Thanks andrewpsy, you saved my day;). The new perl script line worked for me as well. mid-2012 10.10.3 + Samsung Evo 850 500Gb - worked fine! Thank you, works great with my 2010 macbook pro + Corsair SSD. My question is how do you disable before system update? How can I revert back or disable it because I have a new update which fixes graphics for my iMac? Please help. This script still works in 10.10.4 public beta (10.10.4 (14E11f)). This script still works under public beta 10.10.4 (14E17e). MacBook Pro 6,1 (17' Mid-2010), 10.10.3, Samsung 850 pro 1T = Ok! This script still works under public beta 10.10.4 (14E26a). I wonder if it even is necessary to keep kext-dev-mode enabled? I just booted without it, but still having trim enabled (10.10.3). Of course, if somehow the kernel caches get regenerated, the patched extension will be skipped and you can't boot (you have to repair from recovery partition or USB/DVD as explained here). By the way: kextcache doesn't directly check the NVRAM value, but the sysctl settings of kern.bootargs (see function isDevMode() at http://www.opensource.apple.com/source/kext_tools/kext_tools-384.1.4/security.c). Unfortunately, the sysctl value is still read-only and can only be set on boot time via NVRAM. Worked for me with OS X 10.10.3 on macbook pro mid 2009, SSD Corsair Neutron. How to use this script from windows or MAC? @khpatel4991 You'd have to enter those commands in Mac OS X Terminal (in Applications - Utilities). If this is too complicated for you, you're better off using [https://www.cindori.org/software/trimenabler/](Trim Enabler). I just read the happy news that in OSX El Capitan, there will probably be an official OSX-tool named Trimforce, which enables TRIM for all SSDs if the user chooses to do so. Without having to deactivate the kext-signing, that is! I really hope this is true, it would prove that Apple is still able to make sane decisions and listen to their users! With the new 10.10.4 trimforce now enabled, do we still need this? I think it's just a matter of running sudo trimforce enable in your terminal right? @TechFounder: Confirmed. This patch is no longer required. @TechFounder @ralfbergs This is great news. Thanks for sharing! I got some issue when disabling the changes done by this script and booted to the STOP sign screen after using sudo trim force enable, one of the crucial thing I missed when disabling the patched driver is I did not remove the patched driver file in "/Volumes/Your Disk Name", seems the guide in the link is good enough for me to fix https://www.cindori.org/trim-enabler-and-yosemite/, though I did mistyped chown/chmod lucky no permanent damage is done anyway, after all the mess I did at least it is working for the TRIM without a patched driver under 10.10.4! Anyone tried with El Capitan 10.11 yet? I'm getting an Operation not permitted error when trying to make the backup of the driver in the first step. 'trimforce enable' worked like a charm on HighSierra. Thank you so much!